To read the rest on Project S2000 click here! We chose our S2000 as a project car for its handling prowess. With multilink suspension and a 50/50 weight distribution, the S2K has all the right stuff to carve corners with. AP2 S2K’s like our car have revised rear toe link pick up locations so they don’t exhibit the twitchy at the limit cornering issues that the older AP1 chassis has. What’s good can always be made better so we decided to spend our efforts in improving our car’s suspension in the next round of mods. If you’re observant and knowledgeable about S2000s, you’ll probably have noticed we went to a non-staggered setup for the tires. The stock setup for a 2005 S2000 is a 215/45/17 tire on the front with a 17”x7” wheel, and 245/40/17 tire on the rear with a 17”x8.5” wheel. The OEM tires are Bridgestone Potenza RE050s. Our new setup is 245/40/17 Bridgestone Potenza RE-11s on 17”x9”, +63 offset, Volk RE30 wheels all around. 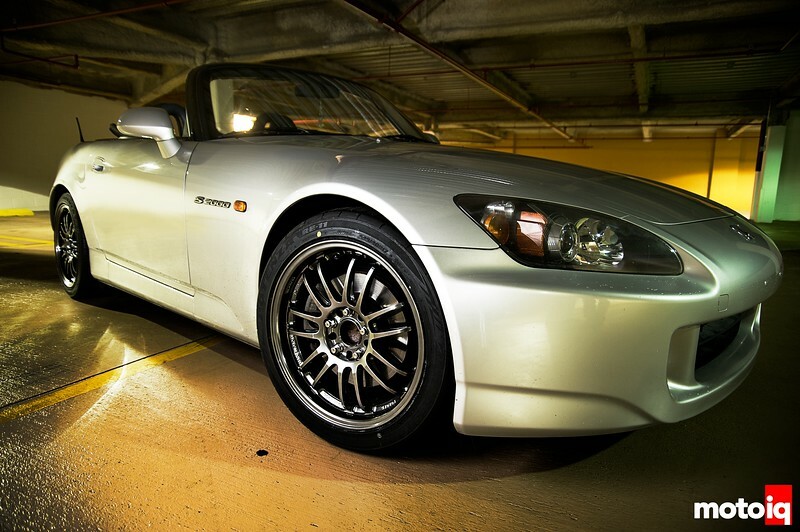 On Project S2000 we decided to run equal sized wheels and tires on both ends of the car. Why did we do it? For a number of reasons, with the primary reason being to increase mechanical grip. Acura did it with their American Lemans LMP cars, so it can’t be that bad of an idea right? A secondary reason is it’ll allow us to rotate the tires. Tires aren’t cheap, so we might as well be able to maximize the life out of them! (Of note, we have gotten extremely even wear front to rear with about 3k miles of street use. The wear is within 1mm.) However, just going to a non-staggered setup without any other changes is a shoddy idea, and we’ll get to that in a moment. Using equal sized tires on all four corners makes some logical sense as the S2000 has a nearly perfect 50/50 weight distribution. With the same weight on the front tires as the rear, it’s rational to put the same size tires front and rear. This is a popular setup for S2000s that are tracked in order to maximize the mechanical grip available. 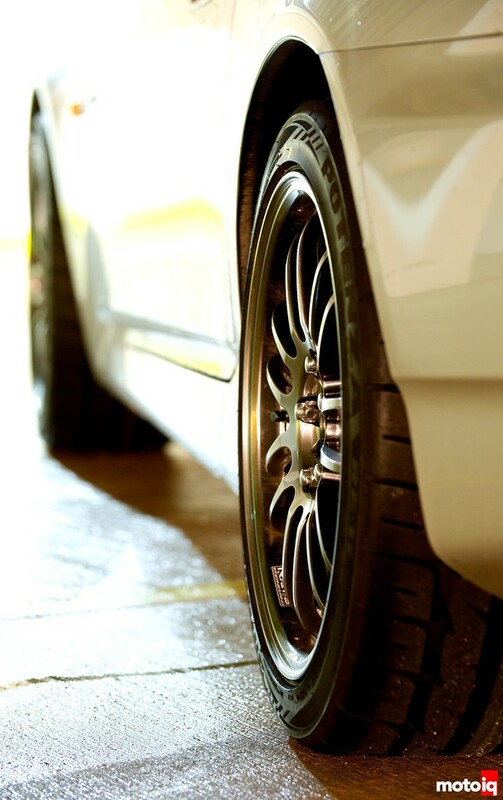 The stock S2000 has a staggered fitment with larger rear tires than the fronts. Why is it a bad idea to mount significantly wider tires up front with no other changes? Well, the S2000 is very well balanced in the stock configuration. We found out on the track that it rotates very well on turn-in with trail-braking, is easily balanced between understeer and oversteer with the throttle mid-corner, and the tail can be coaxed out with the throttle on corner exit. Going to a slightly wider front tire, such as a 225, would probably be okay, but we’re using a 245 (about a 14% increase in width). With everything else remaining the same, oversteer is the end result. At elevated speeds, the willingness of the front end to turn in and the rear feeling loose was quite evident. Entering into a turn hot required extreme caution so as to not swap ends. We decided to run the same size tire front to rear and retune our suspension to exploit this. A bigger front tire is not going to get overworked as easily and we figured that with a near 50/50 weight distribution this made more sense.